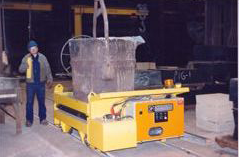 Transfer Cars by Quiptec Inc.
A hot metal ladle/mold transfer car, 20,000 lbs capacity. 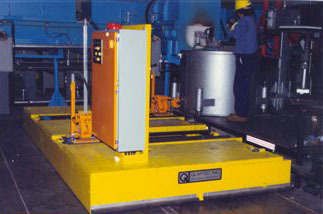 A special circuit ensures that acceleration and deceleration are slow enough to prevent spillage. 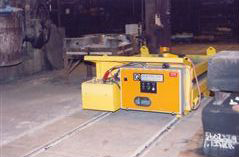 Track wipers keep the trails clear of debris, allowing safe passage of the car up and down the track. 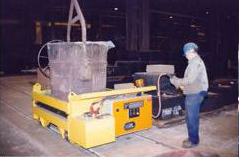 Customized molten metal transfer car with 10,000 lbs capacity. 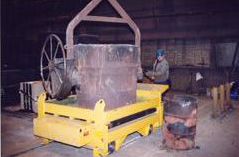 Programmed for semi-automatic operation.